Chilled Tea Compress: Applying chilled tea bag compresses on the eyes and the surrounding area will give you instant relief from the itching. Just soak the tea bags in ice cold water and place it on your eyes for at least 10 minutes. Do this three to four times a day for speedy recovery. Cucumber Therapy: Cucumber contains anti-irritation properties that help reduce puffiness, inflammation, swelling, and irritation. You need to wash the cucumber thoroughly, cut it into thin slices, refrigerate for 20 minutes, and place the slices on your eyes. Repeat this 4 to 5 times a day. Rinse your eyes with it twice a day. Use as eye drops for immediate relief. Around four to five drops of rosewater should calm an itchy eye. Cold Milk: This is one of the most popular natural remedies for itchy eyes. Just dab a cotton ball in cold milk and rub it around the irritated eye. You can also make a compress with a milk-soaked cotton ball for instant cooling effect. Do this twice a day for quicker results. Raw Potato Therapy: Raw potatoes can give you swift relief from itchy eyes. 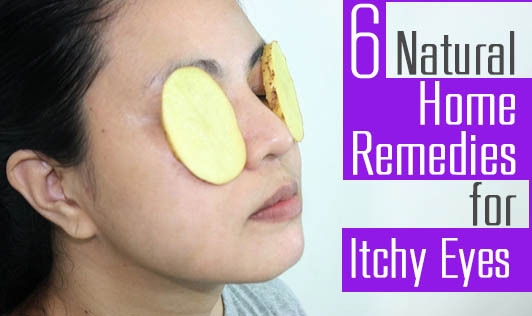 All you need to do is cut a raw potato into thin slices, refrigerate for around 30 minutes, and then place the chilled slices over your eyes for at least 30 minutes. Fenugreek Therapy: Fenugreek (Methi seeds) can give you immediate relief from itchy eyes. You need to soak the fenugreek seeds in water overnight and then make a paste out of it. Apply this paste on your eyes, leave it on for 20 minutes, and then wash off with cold water. Do this twice a day for best results.